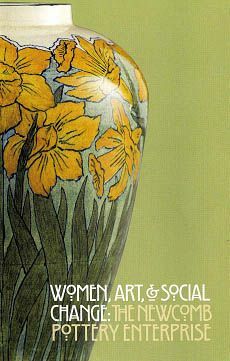 Tarpon Springs, FL -- The Two Red Roses Foundation is pleased to participate in the traveling exhibition: Women, Art, and Social Change: The Newcomb Pottery Enterprise organized by the Smithsonian Institution Traveling Exhibition Service and the Newcomb Art Gallery at Tulane University. Three vases from the Foundation's collection are on loan and will be exhibited along with over 180 objects in the largest exhibition of Newcomb Art in more than thirty years. The exhibition opens at Tulane University's Newcomb Art Gallery in New Orleans and then travels to Athens, Georgia, Orange, Texas, Toronto, Canada, Washington, D.C., finally closing in Nashville, Tennessee. "One of the most significant American art potteries of the twentieth century, Newcomb works are a graceful union of form and decoration inspired by the flora and fauna of the Gulf South. Each piece is one of a kind- and collectively they create a distinctive southern art form. In 1895, the H. Sophie Newcomb Memorial College, Tulane University's women's coordinate college, established the Newcomb Pottery in New Orleans, and conceived it as part artist collective, part social experiment, and part business enterprise initiative under the auspices of an educational program. The art school facultyincorporated the philosophies and tenets of the English Arts and Crafts movement into their curriculum to teach Southern women self-reliance by way of an education and gain financial independence through the sale of their wares. The Pottery thrived until 1940. Today these remarkable, distinctive art objects continue to be critically acclaimed and highly sought-after, and the Newcomb program is a rich mine for academic research. Women, Art, and Social Change: The Newcomb Pottery Enterprise showcases a striking collection of Newcomb pottery, metalwork, bookbinding, and textiles with text that draws from new scholarship to explore the history of the Pottery and its importance as a social and artistic experiment".